Note:- We also provide an android project ( app design ) in minimum price ( all over India ). If you want an android app, just send me your requirement. I will definitely provide the app at a minimum price. For more details. Extreme Recommended:- Like our Facebook Page or Join our Facebook Group and Google plus Community for up-to-date for a new post or if you have any Query and suggestion you can ask here (Facebook group, Facebook Page, and Google Plus). 1. Set the title of the page as " Simple HTML Tags "
2. Within the body perform the following. 2. Create An HTML file link to different HTML page which contains images, tables. 5. Create an HTML page with different types of frames such as floating frame, navigation frame & mixed frame. i). Create an HTML page named as “mixedframe.html”. Divide the page into two columns of 25% & 75% size. In 25% display the image and divide the 75% into two rows. (50% & 50%). In the first 50% display the video file and other 50% the timetable created ii). Create an HTML page named as “navigationframe.html”. Divide the page into two columns of 25%, 75% size. In 25% size call the hyperlink, and make the page to be get displayed in the other column when the link is clicked. iii). Create an HTML page named as “floatingframes.html”. in this file include a paragraph to explain floating frame, and in floating frame include any HTML file. 6. Create An HTML Page Of Different Type Of List (Like Create A List Using Number / Bubble/) And Give The Description Of Any Topic. or Create An HTML Page Of Different Type Of List (Like Ordered List or Unordered List) or How many types of lists are there in HTML? or What tag is used to list individual items of an ordered list? or How do you create an ordered list in HTML? or What is UL and Li in HTML? or HTML Ordered, Unordered, and Definition Lists. 8. A local university has asked you to create an XHTML document that allows prospective students to provide feedback about their campus visit. Your HTML document should contain a form with text boxes for a name, address, and e-mail. Provide checkboxes that allow prospective students to indicate what they liked most about the campus. The checkboxes should include: students, location, campus, atmosphere, dorm rooms and sports. Also, provide radio buttons that ask the prospective students how they became interested in the university. Options should include friends, television, Internet, and other. In addition, provide a text area for additional comments, a submit button and a reset button. Now come to CSS, the full form of CSS is cascading style sheet and we use CSS in web pages for decorating web pages and CSS ( cascading style sheet ) is three types. inline CSS is mostly used when you have used less CSS on your web pages like you are designing a table or registration form so no need to write a CSS separate you can use CSS in HTML tags. Internal CSS is used when you are designing a full web page and you are using a same property of CSS again and again so need to write the same CSS in each tag in HTML just write a code once and used the same CSS effects again and again. We can say that internal CSS or external CSS is same instead of writing CSS code on the same web page we create a new file with extension. CSS (dot.cs) and write all the CSS and link the CSS by given the link of CSS in our web page. So when HTML interpret our web page automatically fetch the request CSS from CSS file location and perform the desired action. Below are some example or web pages with CSS. 2. 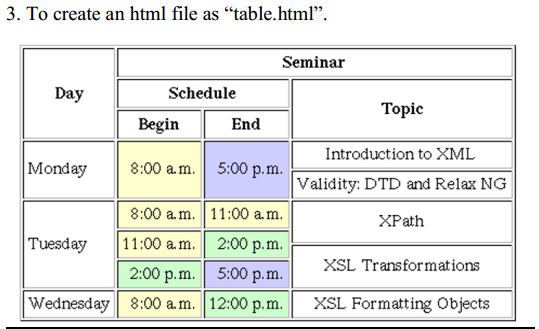 Create the XHTML markup that produces the table shown below. Use em and strong tags as necessary. 3. Create a Box Model using CSS (Cascading Style Sheets) Styles as shown below. 4. Write A Program That Inputs An Encrypted Four-Digit Integer And Decrypts It To Form The Original Number. 7. Create An Online Registration Form For Job Portal. 8. Create A Hospital Web Page With All The Required Menu And Information And Registration And Login in Form.